Everyone deserves to have a healthy and beautiful smile, but nothing can put a damper on your grin quite like tooth decay. Caused by bacteria, tooth decay occurs when your dental enamel - the hard outer layer of your tooth - becomes compromised and starts to develop an infected hole in it. While preventing tooth decay is typically fairly straightforward, many people are surprised to discover how easy it is to prevent cavities from forming in the first place. We here at Arrowhead Oral and Maxillofacial Surgery strive to educate our patients on good oral hygiene to help prevent complications later on from decay. What is a Cavity and Why Does it Form? Bacteria in your mouth are quite common, and at any given time, you can have millions of germs in your mouth. These bacteria can build up against your teeth in a sticky, scummy residue known as plaque. These bacteria can give off toxins and acids that can start to erode at your enamel, making it vulnerable to infection. 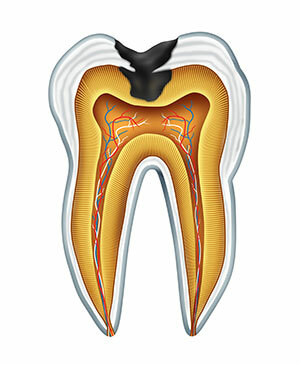 If the bacteria can finally penetrate the enamel, then a cavity forms. Early stage tooth decay can be painless, making early detection all the more vital to prevent it from getting worse. Symptoms of a cavity include an ongoing toothache, pain or discomfort when you bite or chew, sensitivity to heat or cold, and pain when you eat sweet foods. Other signs of a cavity include a visible hole or dark spot in your tooth or staining or discoloration of your tooth. You can prevent tooth decay by taking good care of your teeth. An astounding 32 percent of the population never flosses their teeth, and another 23 percent have gone two or more days without flossing. Brushing and flossing are one of the best things you can do for your teeth; we cannot stress it enough! To protect your teeth from decay, brush your teeth twice a day, morning and night. You need to brush for two minutes each time with a soft-bristled toothbrush and toothpaste with fluoride in it. Floss every morning or every night, at least once per day, to remove all trapped buildup, debris, trapped food, and plaque from between your teeth. Work your floss up under your gums to release any trapped residue from up underneath them, as well. You can also reach for antibacterial mouthwash to kill any lingering germs. Certain foods can encourage tooth decay. It is well-known that bacteria love sugar and eating too many sweets has been shown to cause cavities. Avoid fizzy soft drinks and chewy, gummy candies, as they can stick to your teeth. Eat plenty of healthy, nutritious foods like fruits and vegetables (fruits high in Vitamin C are excellent for your teeth, such as oranges and kiwi, and leafy green vegetables high in Vitamin K are also very beneficial). Foods high in calcium can also be helpful, such as yogurt, milk, and cheese. In addition to brushing and flossing, you also need to schedule an appointment at our office every six months for a routine checkup and cleaning. If you have not seen us in greater than six months and you are ready to schedule your next appointment, please give us here at Arrowhead Oral and Maxillofacial Surgery a call at (623) 738-2564 today!